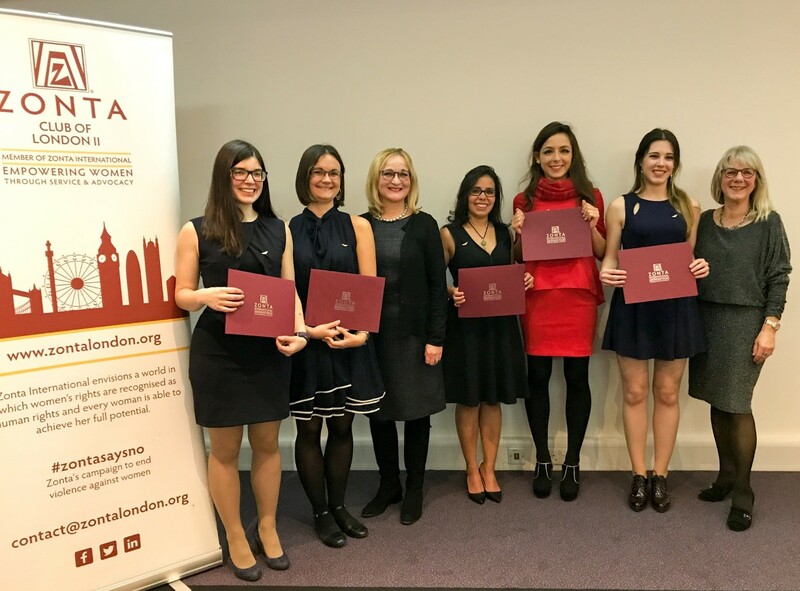 A celebration dinner was held in London on Friday 12 January, to celebrate the five 2017 Amelia Earhart fellows receiving their pins and diploma from the hands of our governor Gabriele Bruebach. Francesca de Domenico, Dafne Gaviria Arcila, Audrey Gaymann, Garazi Gomez de Segura and Rita Neves are all working on their PhD in aeronautical sciences and engineering at universities in England. Joining the five new fellows were seven ‘old’ fellows and together with Zontians from the London II and the Guildford clubs, there were totally 30 guests enjoying the evening. Each of the girl made a short speech explaining the gist of their present research. They are all very impressive with their research work and their impact on this traditionally male dominated area. The Amelia Earhart Fellowship is the most prestigious of Zonta’s awards program, giving each fellow $10,000 in addition to the pin and the diploma. In 2010 roughly 10% of the aerospace industry was made up of women. The number is slowly increasing and to assist the future of women in this field and other aerospace-related sciences and engineering, Zonta International established the Amelia Earhart Fellowship in 1938 in honour of legendary pilot and Zontian, Amelia Earhart, to empower women through encouragement and financial support. The application documents for the 2018 fellowship will be available on the international website www.zonta.org from August 2018. Deadline for application is 15 November, 2018.